John CantonThis past Saturday July 5th I attended the WWE live event held in London, Ontario, Canada. It's not a city that is known worldwide, but with about 350,000 people living here and a state of the art arena we always get at least one WWE live event every year. The city is right between two major cities Detroit and Toronto, so it's an easy stop for WWE and has been since I was a scared 11 year old watching The Undertaker back in 1991. When the show was originally advertised months ago, the face of Daniel Bryan was on all the posters. 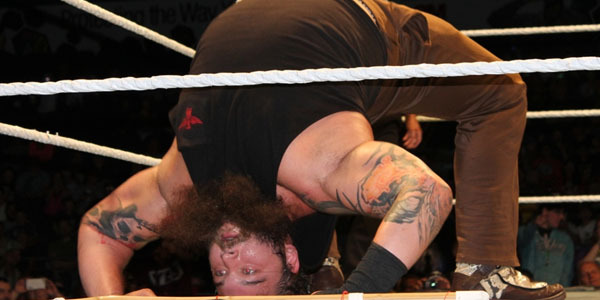 Since he's injured with a major neck injury things got changed and the main event became Roman Reigns vs. Bray Wyatt. It was an upgrade over last year's live event that had an Alberto Del Rio vs. Dolph Ziggler main event. No offense to them, but that didn't feel special. There was also a Great Khali vs. JTG match on that show. This one was much better. The building holds about 10,000 people for a hockey game. They tarped off the second deck. 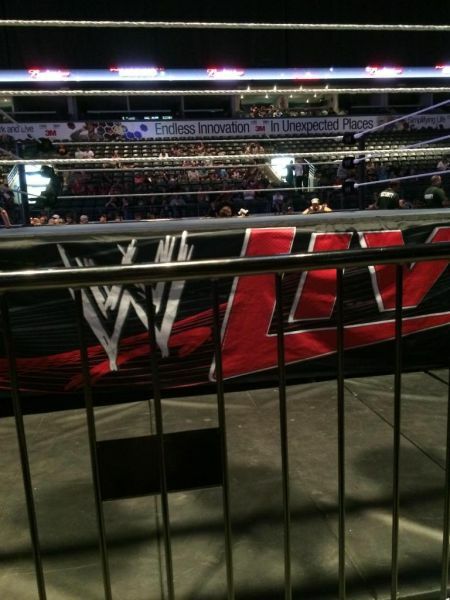 The majority of the first level and ringside was full. This photo is from about 30 minutes before the show started. It did get full on the other side. My guess for the attendance would be about 4,000 people. John CantonOur seats were amazing. Row one right in the center. They were free from a friend in WWE, but the price for ringside tickets at that show was in the $90 range. My friend Steve and I were able to interact with the performers all night. That's the best thing about live events. They can have fun with the fans if they want to. If it was a TV taping or a PPV they have to follow the script closer. Here are some observations from the event along with some exclusive pics.